Forty years ago, Evel Knievel strapped himself into a rocket and tried to fly over Idaho’s immense Snake River Canyon. He didn’t make it. 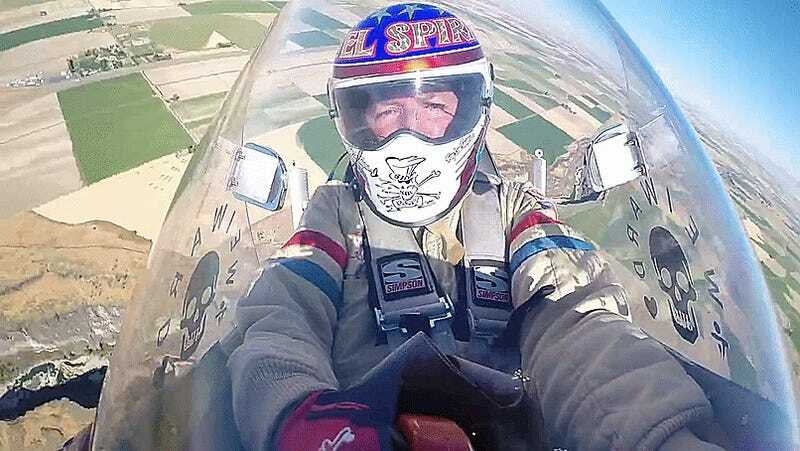 But the stunt launched his lunacy into legend and inspired a generation of adrenaline junkies like Eddie Braun—the man who, this past weekend, completed the epic stunt Knievel couldn’t in a tribute to his hero. Braun is a career stuntman and an early inductee to the cult of Knievel. He didn’t jump the Snake River Canyon to out-class Knievel. On the contrary, Braun’s “return to Snake River Canyon” jump was intended as more as an homage than anything—not that that diminishes his incredible achievement. “My rocket’s called Evel Spirit, not Eddie Braun, for a reason,” he told Jalopnik in a recent interview. Knievel famously attempted to jump the Idaho canyon in 1974 in the steam-powered Skycycle X-2 rocket, but he failed to reach the other side when the vehicle’s parachute prematurely deployed. 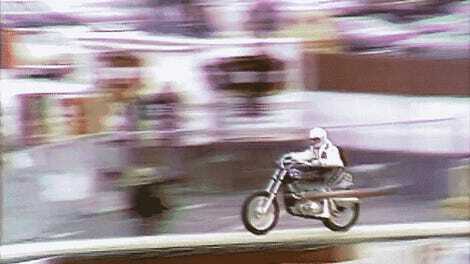 Miraculously, he wasn’t hurt badly, which is more than you can say for many of Knievel’s other jumps. Braun believes he spent $1.6 million dollars to fly 2,000 feet at 400 mph. The whole flight didn’t last more than a couple minutes. A few days after his historic flight, Braun talked with us about why he did it, what it was like, and what’s next. So where did your fascination with Knievel come from? Today we know Knievel’s personal life was a lot messier than the clean white jumpsuits might have suggested, but the influence Braun felt from Knievel’s character is a story we’ve gotten used to hearing from enthusiastic fans—some of whom became professional stunt people. “Right after [meeting Knievel] I got my first injury. Jumping my Schwinn Stingray over trashcans. Broke my arm. I might have been 11,” Braun said. Braun explained that he picked a good time to get into the stunt game– “the heyday of ‘80s cheese”, as he put it. He ended up getting thrown out of windows, crashing cars and jumping off bridges in shows like The Dukes Of Hazzard, The Fall Guy, CHiPs and other action flicks. He eventually went to be Stunt Coordinator on all three Rush Hour movies. And how do you get a job like that? When you’re on a movie set, you don’t just have to nail your performance once. You have to do it over, and over, and a few times more so the director can capture different versions and different angles. This is especially brutal if your scene involves getting kicked or hit or thrown out of a moving vehicle, he said. After 30 years of beatings, Braun’s idea of a retirement party was completing Knievel’s Snake River jump. “I never set out to do what Evel Knievel ‘could not’ do.” Braun said, repeating that several times to make exactly clear what he meant. That dream Braun’s referring to of course is the Snake River Canyon jump. Well, it wasn’t really a “jump” so much as a very short flight. The “Skycycle” is basically a rocket with a parachute. It launches straight into the air from a platform and lands, well, hopefully somewhere flat after deploying a parachute. How did the successful jump actually come together? “I like to say I’d been preparing [to jump the Snake River Canyon] my whole life,” Braun said. The reality was a little more complicated, but mostly because Braun had to wrangle people and land rights to make his dream of Knievel’s dream come true. Knievel getting ready to ride the original Skycycle. Yeah, a barrel doesn’t sound a whole lot safer than a steam-powered rocket design from the 1970's. Which failed. As some fans may remember, when Knievel couldn’t clear the canyon 40 years ago, the failure wasn’t blamed on bad wind or a hangover. The original Skycycle’s parachute popped prematurely and the rocket’s designer Robert Truax took responsibility. He did not attempt it again. The failure of the first rocket is exactly why Braun wanted to make his jump with the same design. Truax passed away in 2010, and his son Scott was a kid about the same age as Braun when Knievel came falling out of the Idaho sky. If a tribute to the Snake River Canyon jump was going down, Braun knew Truax had to be part of the program. Braun described the hardware he used to clear the canyon as “almost form and finish identical” to Knievel’s. The propulsion system actually was identical: just a good old fashioned steam rocket. Thankfully the parachute system was dialed in just a little better this time. Braun told me major action-sport/beverage concerns like Red Bull were circling the project, looking for a profitable angle on the 40th anniversary of Knievel’s Snake River Canyon jump. He didn’t think too highly of these outfits. “If you did not have passion, if you were just looking for a buck, those people weeded themselves out,” he said. I’m guessing the energy drink companies decided trying to replicate Knievel’s stunt would cost more money than it was worth, though Braun said “we were extorted several times” while his team was putting its jump attempt together. Braun refused to elaborate any further than “we chose to pay ransom rather than stopping or killing the project.” I guess we’re going to have to wait for his documentary to come out for more details. By that Braun meant Golebiowski knew this was a passion project. The three major players were living off savings to make this jump happen, and all-up Braun says he dropped about “$1.6 million” into the operation over “about three, three and a half years.” “Never did I think it would take this long,” he added with a laugh. But the timing turned out to be pretty much perfect. So what was the actual jump really like? “I’m winding down my career. I did it to pay homage to the man who inspired me,” Braun said. He also made it clear that he did it for his own four kids. I think the idea was to set an example of following through on dreams, not jumping over canyons, because Braun hasn’t raised a family of stunt people. “Thank goodness they have no interest in doing what I do,” Braun said with a laugh. Now when Braun says he’s going to find “bigger canyons to cross,” he means it metaphorically.